Spode Woodland China Dinnerware - Save 30% Now! The Spode Woodland china pattern is a combination of 2 of Spode's most popular designs: British Flowers from the 1830s and Game Service from the 1930s. The collaborative Woodland Collection was first introduced in 1990 and features beautiful brown floral borders and hunting motifs. Each piece is an individual work of art and features hunting dogs, horses, game fish, birds, elk, rabbits, bears and deer. 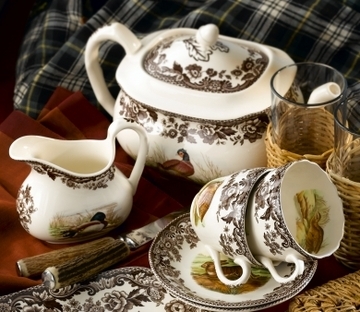 The nature-themed Spode china brings the beauty of the outdoors to your dining room table. Distinctive Decor carries 4 sizes of plates, 2 styles of mugs, a teacup with a saucer and a serving piece for every occasion. There's also pet dishes so your furry family members can also enjoy the high-quality Thanksgiving themed dinnerware. The Spode Woodland collection pairs well with the Spode Delamare pattern which also features the same British Flower border.